Negativwobblyland is a collaboration between Peter Conheim of the sampling art collective Negativland and Jon Leidecker of Wobbly. 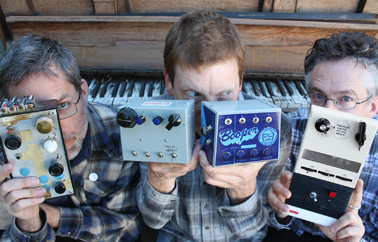 The duo eschews the cut-and-paste mass media collage of their previous work to celebrate the unpredictable magic of the Booper, an instrument invented by Negativland's The Weatherman in 1975. 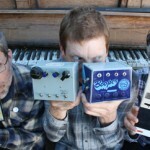 Boopers are 100% analog feedback instruments, created entirely from salvaged radio and amplifier parts, which recycle their outputs back upon themselves to generate an endlessly changing stream of living electronic sound, seeking connections back to the earliest years of the medium. Further captured and transformed by live sampling (itself a form of feedback), the duo's music is inherently improvisatory.